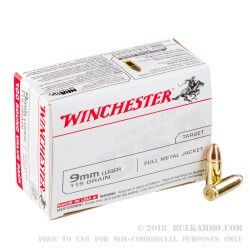 For those who like the convenience of buying in bulk this 9mm ammo by Winchester is a great choice. 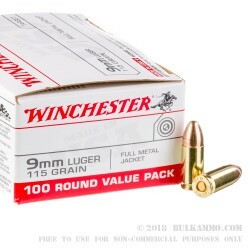 This is the classic "white box" Winchester ammo that you've grown up shooting loaded with 115 grain true full metal jacket bullets. Packaged as a value-pack, this case comes packed with 10 boxes each containing 100 rounds to make sure that you've got plenty of ammo for your upcoming target sessions. 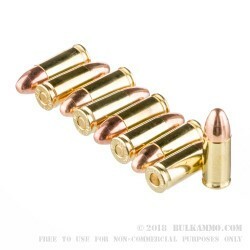 This ammo has a reported muzzle velocity of 1,190 feet per second with an average recoil for the caliber making it well suited for target practice. This ammo is manufactured in Oxford, MS where the team there works hard to deliver consistent quality for serious shooters who demand the best. Winchester ammo is trusted by law enforcement professionals and the US government recently being awarded the MHS contract by the US Army as well as being the second source for 5.56 and 50 cal ammo as a contingency plan for the US military. 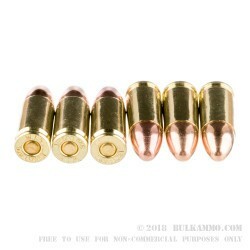 Setting aside the product, Bulk Ammo is a great company to do business with! I was shooting the federal amunition for the 9mm Luger, but after giving these boys a try for only a few pennies more, DAMN what a difference! I've been blowing the bullseye out of every target since! From 7 yards to 20, the bullseye is always blown out. I strongly believe that the majority is the shooter but I wouldn't shot anything else. They have always been reliable, no misshaps or jams. Just smooth shooting! Love them guys! Keep up the great work on making such an affordable, accurate load. Thank you Winchester! Quality product at competitive price. The expediting of the order was quick and packaging was done correctly and protected the product. Great ammo, great price, received it very quick. Service and product were great. Great service & helpful service people. I was amazed how "fast" the whole process took from start to finish. Helpful, friendly,salespeople. Will order again! This ammo comes in 100-rd boxes, with the cartridges packed loose. I would just as soon have the ammo packed loose - handier for range and plinking. This is not rated +P.The casing headstamp is WIN, which corresponds to the factory of Olin Corp., East Alton, IL. Great ammo for a low fair price! Q: What is the velocity of the Winchester 9 mm Lugar 115 grain FMJ 100 round value pack ammo? A: Hello! Winchester lists the muzzle velocity of this round at 1190 fps with a muzzle energy of 362 ft. lbs. A: Hello Joseph, This ammunition is loaded in boxer primed brass cases and the brass can be reloaded. Q: Is this brand new ammo? A: Hello Greg, This Winchester ammunition is new manufacture. Q: Are the Winchester 9 mm FMJ rounds 115 grain brass or steel cased? A: Hello Bernie! This Winchester ammunition is loaded in boxer primed brass casings.